Premium Whiskies are starting to hit thick and fast in the market, and the latest is Chivas Regal Original 25, created by Master Blender Colin Scott, a thirty year veteran of the industry. Scott was in America recently to launch the brand, and was so passionate about this whiskey, that $299 a bottle seemed a bargain. The launch party in Los Angeles that I attended was far more low key than the one they put on in New York a few days earlier, an event reputedly that cost a small fortune. Diana Krall provided the entertainment, and 400 VIP guests and celebrities were the lucky ones trying this whiskey for the first time. Luxury and glamour are the theme of this whisky, and that is reflected in the original packaging, and all with individual numbering. Scott is following in the footsteps of original Master Blender Charles Howard, with whiskies selected for their quality, age and character. When the whiskey was launched 98 years ago in New York, it put Chivas firmly on the map as demand quickly outstripped supply. With the arrival of World War One and the advent of prohibition, the whiskey became a real collector’s item. The upper class hordes just went crazy for the drink, and so they are hoping for a repeat performance this year. 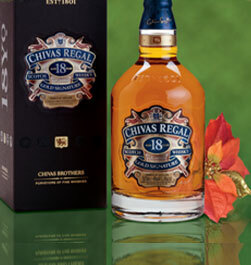 First released in 1909 in Aberdeen by the Chivas brothers, Chivas Regal 25 is a smooth blend with aromas of stone fruit and a hint of creamy marzipan, nuts and chocolate-orange. This is the stuff to bring out on special occasions, and Scott considers the creation of this whiskey as the apex of his career.